The Dubliner has been enjoying a stand-out season for Wolves. 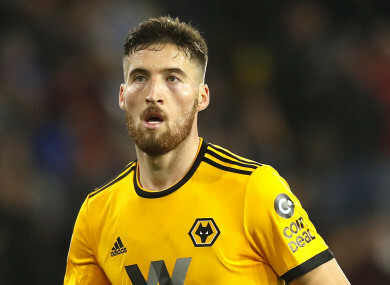 WOLVES KNOCKED PREMIER League leaders Liverpool in the last round, but needed a late fightback from 2-0 down to avoid the shock of the day against Shrewsbury Town, with Ireland defender Matt Doherty scoring a dramatic equaliser in stoppage time. Rangers loanee Greg Docherty smashed the third-tier side into the lead just two minutes into the second-half at New Meadow. Luke Waterfall gave the Shrews a two-goal lead 19 minutes from time with a towering header from a corner. They needed that cushion as Raul Jimenez came off the bench to give the visitors a lifeline and Doherty levelled three minutes into injury time to save Wolves’ blushes. One League One side will be in the next round after a late Ben Whiteman penalty earned Doncaster a 2-1 win over Oldham, where former Cork City forward Kieran Sadlier made his first start for his new club. Meanwhile Watford edged an all-Premier League tie despite Javi Gracia making 11 changes as Andre Grey and Isaac Success scored in a 2-0 win at Newcastle. Newport County’s fairytale continues as the League Two side, who beat Leicester in round three thanks to a late penalty from Carlow’s Padraig Amond, equalised in stoppage time to earn a 1-1 draw at Middlesbrough. Frank Lampard’s Derby County moved into the last 16 with a hard-fought 1-0 win at League One Accrington Stanley thanks to Martyn Waghorn’s winner 12 minutes from time as both sides ended with 10 men. Swansea also booked their place in Monday’s draw by easing past Gillingham 4-1. Two other ties will need a replay to find a winner as Brighton and West Brom played out a 0-0 draw, while QPR’s visit to Portsmouth ended in a 1-1 draw. Email “Matt Doherty to the rescue with 93rd-minute equaliser as Wolves force FA Cup replay”. Feedback on “Matt Doherty to the rescue with 93rd-minute equaliser as Wolves force FA Cup replay”.